My friend Daria visited us from San Francisco this week & suggested we grill some strawberries for dessert. We never ended up doing it while she was here but in her honor we did it tonight. You can just see the grill marks on that front strawberry. I went back & forth on how to best do this. Slice them & cook them in a grilling basket? Just put them on the grill whole? Finally I decided to skewer them whole, though I was a little worried they might soften too much & fall off the skewers. 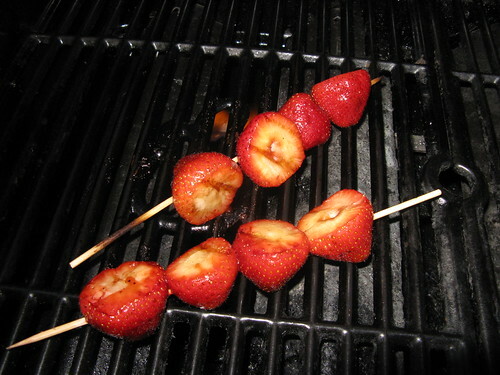 It ended up working just fine & we were able to turn the skewers without losing any strawberries. They came off the grill warm & slightly soft & perfect on top of French vanilla ice cream. The balsamic flavor didn't come across very strong so next time I may pour a little more over the top of the strawberries & ice cream. Matt thought they didn't need anything else. This would be a really nice ending to any bbq. 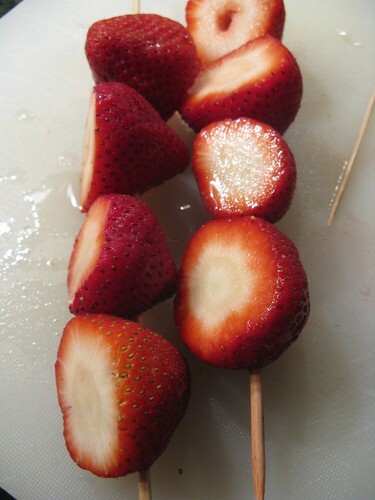 Put the strawberries on two wooden or metal skewers (if using wood make sure to soak them in water first). Mix the balsamic, oil & sugar together. Brush the berries on all side with the balsamic mixture. Place over direct medium heat on the grill. Cook for 4 - 6 minutes turning once or twice. 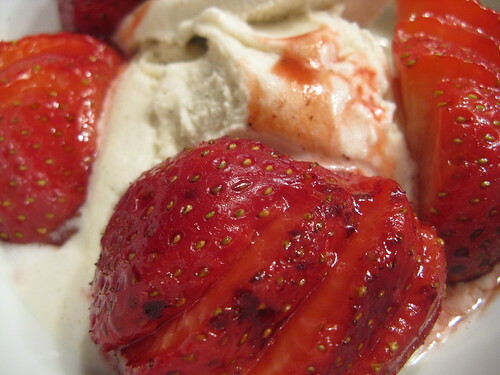 Take the strawberries off the skewers, slice & serve over ice cream. I had never heard of grilling strawberries before, but then I saw another blog that did it this week. They sound so delicious! Yum... I've tried something like this before and it was great. That does look good! I eat strawberries all the time but I have never grilled them! Congrats on your Finest Foodies Friday! Oh I bet these were good over ice cream.